The Oklahoma City office environmental group suited-up 25 students as part of Biology and Engineering for a Sustainable Tomorrow Summer Camp held in the area this past summer. The camp was designed to introduce students to the vast world of biology and engineering as applied in everyday life. Campers visited the Terracon office, and learned more about STEM careers, including math, technology, science, and engineering, and were encouraged look into careers in these fields. 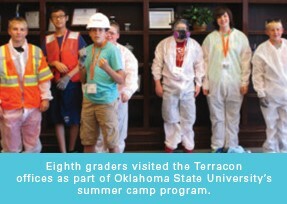 Terracon partnered with Oklahoma State University for this camp.